a. Often fidgets with or taps hands or feet or squirms in seat. b. Often leaves seat in situations when remaining seated is expected (e.g., leaves his or her place in the classroom, in the office or other workplace, or in other situations that require remaining in place). d. Often unable to play or engage in leisure activities quietly. e. Is often “on the go,” acting as if “driven by a motor” (e.g., is unable to be or uncomfortable being still for extended time, as in restaurants, meetings; may be experienced by others as being restless or difficult to keep up with). g. Often blurts out an answer before a question has been completed (e.g., completes people’s sentences; cannot wait for turn in conversation). h. Often has difficulty waiting his or her turn (e.g., while waiting in line). i. Often interrupts or intrudes on others (e.g., butts into conversations, games, or activities; may start using other people’s things without asking or receiving permission; for adolescents and adults, may intrude into or take over what others are doing). B. 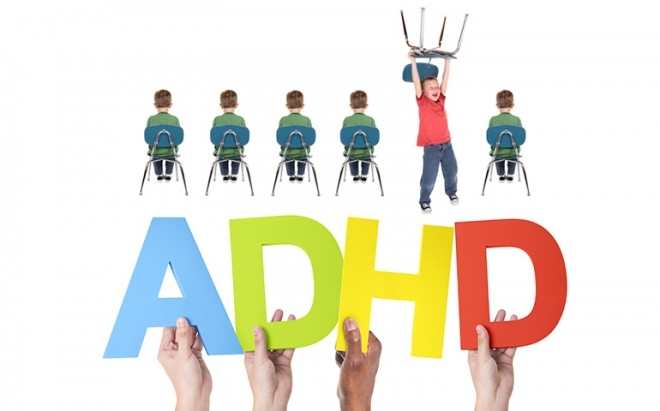 Several inattentive or hyperactive-impulsive symptoms were present prior to age 12 years. C. Several inattentive or hyperactive-impulsive symptoms are present in two or more settings (e.g., at home, school, or work; with friends or relatives; in other activities). D. There is clear evidence that the symptoms interfere with, or reduce the quality of, social, academic, or occupational functioning. E. The symptoms do not occur exclusively during the course of schizophrenia or another psychotic disorder and are not better explained by another mental disorder (e.g., mood disorder, anxiety disorder, dissociative disorder, personality disorder, substance intoxication or withdrawal). 314.01 (F90.2) Combined presentation: If both Criterion A1 (inattention) and Criterion A2 (hyperactivity-impulsivity) are met for the past 6 months. 314.00 (F90.0) Predominantly inattentive presentation: If Criterion A1 (inattention) is met but Criterion A2 (hyperactivity-impulsivity) is not met for the past 6 months. is met but Criterion A1 (inattention) is not met over the past 6 months. Mild: Few, if any, symptoms in excess of those required to make the diagnosis are present, and symptoms result in only minor functional impairments. Moderate: Symptoms or functional impairment between “mild” and “severe” are present. Severe: Many symptoms in excess of those required to make the diagnosis, or several symptoms that are particularly severe, are present, or the symptoms result in marked impairment in social or occupational functioning. Diagnostic and statistical manual of mental disorders :DSM-5 (5th ed.) (2013) . Bipolar disorder. Washington: AmericanPsychiatric Publishing. 645, 663–6. ISBN 9780890425558.